Garage conversion next to main house, 2 acre garden/ surrounded by trees/fields. The property sleeps four people. one double bed and two single put you up beds. 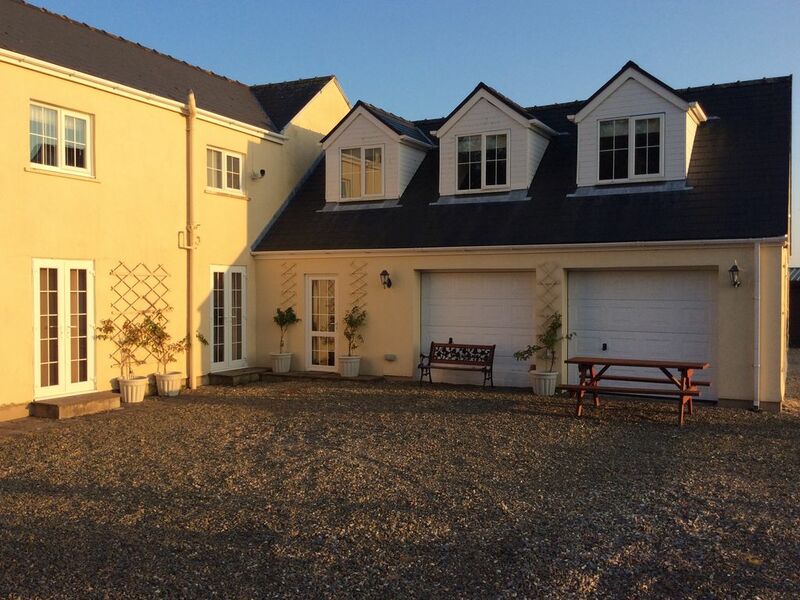 The property is on the border of Martletwy, outside the market town of Narberth. Close to Oakwood and Bluestone and an easy drive to beaches, castles and great walks. The property is private but not remote. Shopping towns of Carmarthen and Haverfordwest close by. Ferry crossings at Fishguard and Pembroke Dock. Marina and oil port at Milford haven 20 mins. Excellent cycle and walking routes. The area is well situated for a relaxing break or an action filled adventure. The area is surrounded by fields and trees. It is private but not remote. Easy access to all the beaches and local attractions. You will need transport, but road links are good. The area is peaceful and quiet, not overlooked by other dwellings. Its a tranquil haven. Large airy bathroom with double walk in shower, toilet , wash hand basin and storage. The light, airy lounge has two dbl sofas (one being a sofa bed) freesat tv, dvd dining area and fitted kitchen . Underfloor heating plus two extra heathers. Tiled floor. Fully fitted kitchen, washing machine, microwave, toaster , kettle, cooker and fridge/freezer -plus all necessary utensils. Tenby golf club is 20 /30 minutes drive. Heatherton has crazy golf and putting green. Haverfordwest golf club is 15 mins away. Beaches, beautiful walks, cycle tracks all within easy access. There ia a riding stables and a great pub all within walking distance. We only booked for 2 nights - a nice little getaway for the weekend but wished we had booked longer. The cottage is very clean, well-equipped, has superb views over the countryside and is a perfect base for exploring the area. We took our Airedale, Ella, with us and she thoroughly enjoyed the safe grounds to roam and play in. Many cottages advertise themselves as dog friendly but when you get there, they're not really. This cottage IS dog-friendly and Joanne was so welcoming to us all, we all felt truly relaxed. This cottage is not far from any of the stunning beaches, coastline walks, castles and pubs-so you really don't have to travel far. What a gem of a place - we will definitely return. Thank you Joanne. Fab host, fab place to stay, everything you need is provided. Great location. Very clean. Reasonably priced. Dog friendly. Would definitely recommend and will likely use this property again. Lots to do in the area. Cottage was comfortable. If you want a beach holiday or a children (even adult) fun fuelled adventure, Pembrokeshire offers everything you could ever want from a holiday. Drws Nesaf is a central location and has easy access to major towns. Pets are welcome - no more than two dogs - £10 per dog per stay. Please bring your own throws to cover furniture when bringing dogs.